At AirZone HVAC Services, we want to make sure that you are getting fair value for your dollar. If there is something that you can fix easily yourself (and prefer to do it), we would rather give you some helpful information to aid you in your repair. Is your Air Conditioner not working correctly? Follow the steps below to troubleshoot the issue. And if you need additional assistance, we are always here to come out and do a service call. The first thing you should always check when having issues with your air conditioner is whether it is turning automatically or not. You can find this out quickly by ensuring that your thermostat is set to “cool”. Next, make sure that the temperature on the thermostat is set lower than the temperature in the home. Have a look at your electrical connections – Is there a blown fuse? A tripped circuit? Is the power switch set to ON for your furnace and condenser? Next let’s have a look at the blower unit. 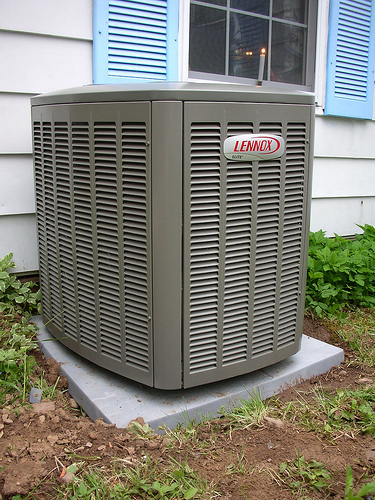 Sometimes an air conditioner gets clogged up, and does not put out enough air flow. To check this, go outside to your air conditioner housing. Check for damage to any blades or debris in the blower. Think about where your ducts might be pinched inside your home to prevent the flow of cool air. If you are still having problems with your air conditioner, we recommend that you contact our experts at AirZone HVAC Services. We offer some of the lowest diagnostic rates in the greater Ottawa area, and will go to either end of the city including Rockland and Renfrew to fix your problem! Give us a call at 613-592-5770 to see how AirZone can help!